For the first time in Crystal Cruises’ history, Crystal Symphony and Crystal Serenity will each embark on World Cruises in 2018 – offering travellers four separate global itineraries. Ranging from 97 to 129 days, the innovative voyages will travel to a combined 111 destinations in 45 countries, featuring 16 maiden calls and 50 overnights. World Cruise One goes from Cape Town to Miami from January 7 to April 30 in 2018. This 114-day sailing covers much of the southern hemisphere before exploring the Caribbean. The 112-day World Cruise Two connects Los Angeles to Rome from January 23 to May 16, covering the South Pacific, Australia, Indonesia, Southeast Asia, India, Dubai and the Mediterranean. 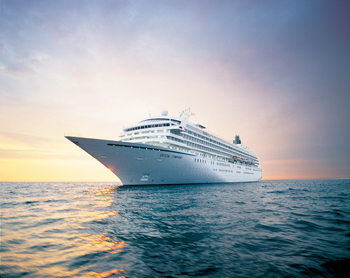 World Cruise Three goes from Cape Town to Rome and World Cruise Four, Los Angeles to Miami. Crystal’s ground-breaking World Cruise revelation comes close on the heels of an agreement with Genting Hong Kong (GHK) on the sale of Crystal Cruises. With the support of GHK’s financial resources and expertise in ship design, Crystal Cruises’ fleet size will expand with the build and delivery of a new ship in 2018, elevating the standard of luxury cruising and luxury cruise ships. The acquisition is expected to close in the second quarter of 2015. Until April 30 this year full World Cruise fares start at $47,150 per person. Dnata has signed an agreement to purchase a majority stake in Imagine Cruising, one of the UK’s leading cruise and stay holiday distributors with expertise in both the tour operating and retailing of cruise. “Imagine Cruising is a key distributor of cruise products around the world. The addition of the company to the dnata portfolio adds expertise in the growing cruise sector, strengthening our position as an international leader in travel services,” says Iain Andrew, divisional senior vice-president of dnata’s travel business. Completion of the acquisition remains subject to merger control clearance in South Africa. Luggage Forward, leading doorstep to destination luggage delivery, announced the launch of its online booking engine designed for shipping bags to and from cruises. This first-of-its-kind platform provides passengers, logistics providers, and cruise lines with a streamlined interface to manage the process of sending luggage to or from any cruise ship worldwide. This interface was developed using Luggage Forward’s decade of experience shipping luggage to cruises. Paul Gauguin Cruises, luxury cruise ship operator in the South Pacific, has announced new itineraries for 2016. It is offering savings of 50 per cent on standard cruise fares on all 2016 voyages, plus airfare. New for 2016 on The Gauguin is a seven-night Tahiti, the Society Islands and Tuamotus voyage that adds the Tuamotus archipelago to the line’s most popular Polynesian itinerary with visits to Tahiti, Society Islands, Tuamotus, and more. The sailing departs February 6, 2016, with cruise fares from $5,345 per person, including airfare from Los Angeles. The new 11-night Society Islands and Tuamotus sailing features a second full day on the line’s private island paradise of Motu Mahana. Ports include Papeete, Tahiti; Huahine, Society Islands; Taha’a (Motu Mahana), Society Islands; Bora Bora, Society Islands (overnight); Rangiroa, Tuamotus; Fakarava, Tuamotus; Taha’a (Motu Mahana), Society Islands; Moorea, Society Islands (overnight); and Papeete, Tahiti (overnight). The December 3, 2016, voyage offers cruise fares from $5,845 per person, including airfare from Los Angeles.